Bible study has reached a new level of greatness. For the first time you can experience the complete Old and New Testament visually in a one mile long Leporello. Leipzig, Germany, May 23, 2016 -- Bible study has reached a new level of greatness. 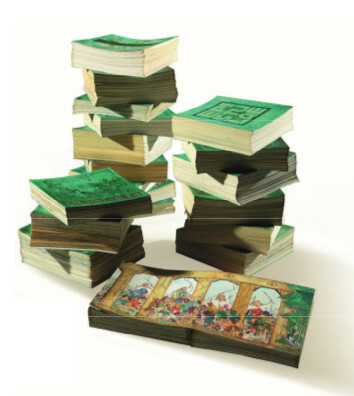 For the first time you can experience the complete Old and New Testament visually in a one mile long Leporello (concertina folder). One of the greatest works an artist has created yet will be shown at the 100th Katholikentag in Leipzig: THE WIEDMANN BIBLE. It has been found about two years ago after being hidden in a gallery's attic for decades. Willy Wiedmann painted this one of a kind artwork over the course of 16 years. It has a total length of over a mile and represents as the only hand-painted Bible worldwide encompassing both the Old and New Testament in 3,333 pictures. He originally painted THE WIEDMANN BIBLE in order to bring Christians closer to The Holy Scriptures without the distractions or interpretations of the written word. As THE WIEDMANN BIBLE is a visual representation of The Holy Scriptures, it transcends all languages and allows anyone and everyone to experience it. Regardless of reading comprehension levels or language background, anyone can understand the stories of The Bible through THE WIEDMANN BIBLE's images. Wiedmann's son Martin took it upon himself to complete his father's mission. "My father passionately worked on this project, putting his heart and soul into this unique artwork to give people a better understanding of and bring them closer to The Bible. He was also a philanthropist. Therefore we have decided that parts of the proceeds will be donated to charity and parts reinvested into THE WIEDMANN BIBLE to share his work with the world." All of the 3,333 images are now digitalized and available as App, eBook, DVD, etc. The original will be shown at the 100th Deutsche Katholikentag in Leipzig.